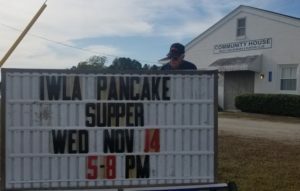 We had a good turnout at our recent Pancake Supper. This annual chapter fundraising event was chaired by chapter Ike Rita Carpenter again this year, and we appreciate her hard work in making this event a success. We are very grateful to all the member volunteers who filled the volunteer work rosters of which there were many, and to all the members who sold pancake supper tickets in advance. Below is a slideshow of photos taken during this event, for your enjoyment/perusal!